Want an All Inclusive Holiday Deal from Ireland? Choose SunSearch! For the best value and choice in an all inclusive holiday, you should choose SunSearch Holidays. We have an amazing selection of all inclusive holiday deals for your persual, just check them out below. An all inclusive holiday deal is a wonderful way to spend a holiday in the sun as it is so hassle free. Let SunSearch find the perfect destination for you! 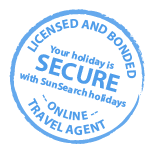 Choose an all inclusive holiday deal to Spain, Portugal, Greece Bulgaria and many others regularly added. All Inclusive Sun Holidays – Why Choose Them? All inclusive sun holidays make your trip abroad even more relaxing because they include the costs that you often forget to factor in for a holiday like food, drink, hotel activities and entertainment. These costs when not included on an all inclusive basis can really hike up your spend and blow your budget, therefore an all inclusive holiday deal is a great idea. You will be able to pay in advance for what you would normally spend when you get there, so maybe put that money aside for shopping! Book an all inclusive holiday from Ireland with SunSearch and relax in the comfort of knowing that pure bliss awaits you at your destination.